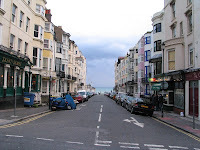 Eu nunca imaginaria ver um lugar na Inglaterra como Brighton. A energia do lugar, o astral das pessoas na rua, nos pubs…simplesmente demais! Deve ser o efeito do mar, ainda que a praia não tenha areia, e sim pedras! E sem falar da arquitetura da cidade que é muito peculiar, com casas e prédios totalmente distintos dos vistos em Canterbury e Salisbury, por exemplo. E que outro lugar melhor que Brighton para ter um palácio como o Royal Pavillion, suntuoso, luxuoso no melhor estilo do oriente. Dica: vá tomar umas cervejas no St. Christopher – um pub+albergue em frente ao Pier, com uma galera animada e música ao vivo! 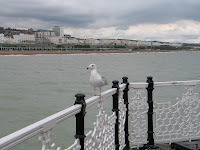 I have never thought visiting a city like Brighton in England. The energy of the city, the people´s mood on the streets or pubs were simply amazing! 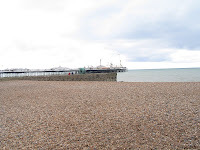 It must be the sea effect, even with stones on the beach instead of sand! 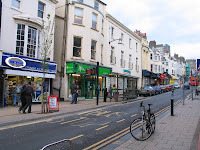 And I must mention the architecture of the city with houses and buildings completely different from the ones in Canterbury or Salisbury, for example. 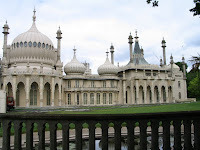 I couldn´t see anywhere else in England a palace like Royal Pavillion sumptuous on the best Oriental style. Hint: go to St. Christopher to have some pints. 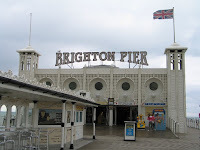 It´s a pub+hostel in front of the Pier with nice atmosphere and live music. Um típico exemplo da noite de Brighton?… não sei,mas isso foi lá! 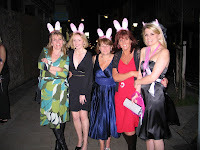 A typical Brighton nightlife style?… I don´t know, but it was there!